The 2015–16 FIA Formula E season was the second season of the FIA Formula E championship, held from 24 October 2015 to 3 July 2016. The season sees the introduction of eight manufacturers, who are allowed to develop new power trains, specifically the e-motor, the inverter, the gearbox and the cooling system. Nelson Piquet Jr. was the defending Drivers' Champion and Renault e.dams successfully defended teams champion. After ten rounds, Sebastien Buemi won the championship by just two points over Lucas di Grassi after setting the fastest lap in the final race, where neither driver finished following an opening lap crash and several attempts to set the fastest lap in their second cars. The second season was planned to again feature 10 teams that were essentially identical from the inaugural season. But, the withdrawal of Trulli after failing to enter the first two races left 9 teams competing for the 2015–16 season. Additionally, there are 8 manufacturers of power trains that work together with or are part of the individual teams. Initially only Team Aguri decided to keep the power train from the previous season, while Dragon use the Venturi power train. Due to the regulations, all teams use the same chassis as in the first season. The 8 manufacturers were homologated by the FIA in August 2015. After troublesome preseason testing, Andretti decided to revert to the power train from the inaugural season. All ten teams from the first season intended to compete in season two, with some name changes due to sponsorship changes or manufacturer cooperations. Eight teams became manufacturers and produce components either by themselves or with a technology partner: Abt (with Schaeffler), Andretti, e.Dams (with Renault) Mahindra, NEXTEV, Trulli (with Motomatica), Venturi, and Virgin (with DS/Citroën). On 25 August 2015, Andretti decided to retain the powertrain from the previous season. After failing to pass scrutineering of their new drivetrain for the first two races, Trulli withdrew from the championship, leaving 9 teams to compete for the rest of the season. Karun Chandhok, Jaime Alguersuari and Jarno Trulli who raced for Mahindra, Virgin and Trulli respectively in the 2014–15 season, announced that they would not compete in 2015–16. 1997 Formula One World Champion Jacques Villeneuve joined Venturi, replacing Nick Heidfeld, who moved to Mahindra. Jean-Éric Vergne who competed part-time for Andretti during the 2014–15 season moved to Virgin for a full-time drive, replacing Jaime Alguersuari. Salvador Durán who competed for Amlin Aguri during the 2014–15 season joined the Trulli team, replacing Jarno Trulli. Oliver Turvey, who raced for Team China in the London round of the 2014–15 season, now races with the team full-time. GP2 Series veteran Nathanaël Berthon has secured the second Team Aguri seat. Following a hand injury sustained in Putrajaya, Nick Heidfeld was forced to miss the next round in Punta del Este. He was replaced by reigning Formula Renault 3.5 champion Oliver Rowland. After three rounds with the Venturi team, Jacques Villeneuve left due to a "disagreement on the direction of the team". His seat was taken by Mike Conway. 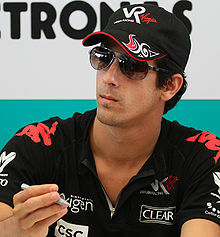 After three rounds Salvador Durán re-joined Team Aguri for the rest of the season after they split with Nathanaël Berthon. The Mexican driver already competed in nine rounds of the first season for Team Aguri. After another three rounds, he was replaced by Chinese driver Ma Qing Hua for the Paris ePrix. Ma then competed in the Berlin ePrix and the two races of the London ePrix. Due to a DTM commitment, António Félix da Costa missed round 8, but returned for the London ePrix. His replacement was endurance racer René Rast. The rules were opened up for the second season, in keeping with the series' long-term plan to use a single car over the course of a race instead of two separate chassis. Teams are free to pursue their own development of the powertrain, including the e-motor, inverter, gearbox and cooling system. The maximum power usage during the race was increased from 150 kW to 170 kW. The total allowed energy consumption from the battery remains limited at 28 kWh. The season was scheduled to include 11 races, held between October 2015 and July 2016. The final calendar was approved by the World Motor Sports Council in October. However, in May 2016, the Moscow ePrix was cancelled "due to recent and unforeseen circumstances related to road closures", reducing the season to 10 races. The Miami ePrix was dropped after the first season. The Monaco ePrix did not feature in this season's calendar, but returned the following season. The Mexico City ePrix (the first race on a permanent racing circuit) and the Paris ePrix are new additions to the calendar. The Berlin ePrix is moved from Tempelhof Airport to the center of Berlin. The Moscow ePrix was cancelled in mid-season. ^ Jérôme d'Ambrosio set the fastest lap during the race, but his lap was removed due to corner-cutting. ^ Lucas di Grassi and Audi Sport Abt were the initial winners but were disqualified when di Grassi's car was found to be underweight. ^ António Félix da Costa set the fastest time but he was excluded due to an irregular tyre pressure level. Unlike the previous season, all results count towards the total. ^ a b c d e "FIA homologates manufacturers for second Formula E season". Formula E Holdings Limited. 2015-08-03. ^ a b "Trulli Formula E Team announce withdrawal from championship". fiaformulae.com. 15 December 2015. ^ a b c "Andretti reverts to season one powertrain". fiaformulae.com. 2015-08-27. ^ a b Watkins, Gary (26 March 2015). "Formula E targeting races without car changes by 2018/19 season". Autosport. Haymarket. Retrieved 26 March 2015. ^ "Nelson Piquet Jr signs multi-year Formula E deal". Motorsport.com. 16 May 2015. Retrieved 16 May 2015. ^ a b Mitchell, Scott (September 14, 2015). "Team China Racing confirms Oliver Turvey for Formula E season". Autosport. Retrieved September 14, 2015. ^ a b c "DS Virgin Racing confirms Sam Bird and Jean-Eric Vergne". electricautosport.com. 2015-08-08. ^ a b c d Smith, Sam (4 August 2015). "Duval set to remain with Dragon Racing | Formula E news | Motorsport.com". Motorsport.com. Retrieved 8 August 2015. ^ a b DeGroot, Nick (7 August 2015). "Villeneuve signs with Venturi for upcoming Formula E season | Formula E news | Motorsport.com". Motorsport.com. Retrieved 8 August 2015. ^ "Mike Conway to race for Venturi in Buenos Aires". Formula E. 22 January 2016. Retrieved 22 January 2016. ^ "Jerome D'Ambrosio to remain at Dragon next season". fiaformulae.com. 27 July 2015. Retrieved 27 July 2015. ^ Watkins, Gary (18 March 2015). "Jarno Trulli to assess driving future after maiden Formula E season". Autosport. Haymarket. Retrieved 18 March 2015. ^ a b c Thorn, Laurence (24 August 2015). "Durán signs with Trulli for season 2; will partner Liuzzi". e-racing.net. e-racing.net. Archived from the original on 23 September 2015. Retrieved 24 August 2015. ^ "Malaysia Formula E: Jarno Trulli in for Salvador Duran in Putrajaya". Autosport. 6 November 2015. Retrieved 6 November 2015. ^ "Formula E championship leader Lucas di Grassi extends Abt deal". Autosport. 7 May 2015. Retrieved 8 May 2015. ^ "Daniel Abt extends deal with Audi Sport ABT". Formula E. 21 May 2015. Retrieved 23 May 2015. ^ a b Smith, Topher (10 August 2015). "Mahindra confirm Senna and Heidfeld for season two". e-racing.net. e-racing.net. Archived from the original on 27 September 2015. Retrieved 10 August 2015. ^ "Oliver Rowland replaces injured Heidfeld". fiaformulae.com. 4 December 2015. Retrieved 4 December 2015. ^ a b "Andretti Formula E team welcomes Robin Frijns". Andretti Autosport. 17 September 2015. Retrieved 17 September 2015. ^ "Drones, drivers and 200mph". current-e.com. 2015-08-06. ^ Biesbrouck, Tim (8 July 2015). "Exclusive: Team Aguri's Mark Preston on season two and beyond". Electric Autosport. Formula Blue Media. Retrieved 13 July 2015. ^ "Team Aguri confirms Da Costa to race in season two". Formula E. 9 October 2015. ^ a b Smith, Topher (18 May 2016). "Rast to debut at Berlin ePrix". e-racing.net. Retrieved 18 May 2016. ^ a b "Berthon secures second Aguri Formula E seat". Motorsport.com. 16 October 2015. Retrieved 16 October 2015. ^ "Salvador Duran joins Team Aguri". fiaformulae.com. 28 January 2016. Retrieved 28 January 2016. ^ a b "Ma Qing Hua replaces Salvador Duran at Team Aguri". fiaformulae.com. 20 April 2016. Retrieved 20 April 2016. ^ Giordmaina, Jack (6 August 2015). "Chandhok Set to Walk away from Formula E". Formula E Zone. Retrieved 6 August 2015. ^ Giordmaina, Jack (6 August 2015). "Alguersuari Rules Himself out of Virgin Drive". Formula E Zone. Retrieved 6 August 2015. ^ Thorn, Laurence (24 August 2015). "Trulli steps aside from driving duties". e-racing.net. e-racing.net. Archived from the original on 2015-09-23. Retrieved 24 August 2015. ^ Waring, Bethonie (4 December 2015). "Heidfeld replaced for Punta del Este". e-racing.net. Retrieved 23 January 2016. ^ Grzelak, Antonia (22 January 2016). "Conway to replace Villeneuve at Venturi". e-racing.net. Retrieved 23 January 2016. ^ "Salvador Duran joins Team Aguri". fiaformulae.com. 28 January 2016. ^ "Alejandro Agag fan Q&A – Part 1". FIA Formula E. 29 September 2014. Archived from the original on 24 February 2015. Retrieved 24 February 2015. ^ "Race mode power hike for season two". fiaformulae.com. 2015-09-11. ^ a b c d Biesbrouck, Tim (1 October 2015). "Updated Formula E calendar and rules for season 2". Electric Autosport. Retrieved 1 October 2015. ^ a b "Formula E will not race in Moscow on June 4". fiaformula.com. 6 May 2016. ^ "2015–16 FIA Formula E Championship". formulae.com. Archived from the original on 2014-12-28. Retrieved 2015-08-07. ^ "New central location for Berlin ePrix". fiaformulae.com. 15 February 2016. Wikimedia Commons has media related to 2015–16 Formula E season.